$790.00 Order of Glory, 2nd cl, Type 2 ("thin"), #10665, February 1945 issue to an artillery sergeant in a Guards Cavalry unit. During the offensive in East Prussia he commanded a gun crew that within two days destroyed two German military trucks, wiped out a machine-gun nest, and eliminated 25 German soldiers. It is interesting to note that the fighting took place on approaches to Tannenburg, the same area where Russian Imperial Army suffered a catastrophic defeat in 1914. The outcome of course would be very different in 1945. The order is in very fine condition. Comes with archival research. $650.00 Order of Glory, 2nd cl., Type 3, #24084, awarded to a Sergeant Major of the Guards Artillery, 1st Belorussian Front. A veteran of the battle of Stalingrad, liberation of Odessa, and forced crossings of the Dnieper, Vistula and Oder, he had been previously awarded with two Medals for Valor and Order of Glory, 3rd cl. He earned the Glory 2nd cl. on the first days of the battle for Berlin by destroying eight German machine- guns, two pillboxes, and large number of infantry near Seelow Heights. The order is in fine to very fine condition. Includes archival research. $190.00 Order of Glory, 3rd cl., Type 2 Var. 1, #147396, awarded to a submachine gunner, a Tatar national, for fighting in Lithuania in August 1944. He killed 4 German soldiers at close quarters and despite receiving a concussion, did not leave the battlefield. The order is in excellent condition. Comes with archival research. $95.00 Order of Glory, 3rd cl., Type 2 Var. 1, #330201, circa 1945. "Smooth" clock face sub-variation in very fine to excellent condition. Includes original suspension. $225.00 Order of Glory, 3rd cl., Type 2, Var. 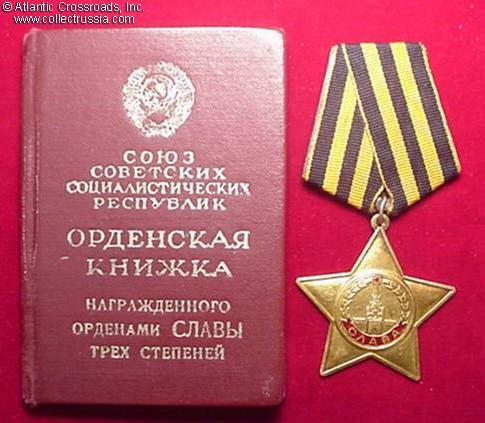 1, #436169, awarded in August 1944 to an antitank rifle operator in the 4th Guards Kuban Cossack Cavalry Corps, 1st Belorussian Front. On a single day in August 1944 he destroyed a German weapon nest with his PTR rifle and killed 16 Nazi soldiers with submachine gun at point blank range. The award is in very fine to excellent condition and comes with archival research. $80.00 Order of Glory, 3rd cl., #775556, circa 1970s. A belated award to a WW2 veteran. In outstanding condition. $45.00 "Soldier's Glory", Volume 5. I. Roschin. C. 1981, Moscow. Russian text, hard cover, 285 pp. The book contains essays about 70 recipients of the Order of Glory, 1st cl. accompanied by their photos. This scarce out-of-print reference is great supplement to the standard reference guide or information that can be found online. $35.00 "Soldier's Glory", Volume 6. I. Roschin. C. 1982, Moscow. Russian text, hard cover, 255 pp.